(TibetanReview.net, Sep27, 2017) – Following a meeting on Sep 24 morning with Tibet’s exiled spiritual leader, the Dalai Lama, in the company of MPs from other Baltic States, MPs from Lithuania have decided to set up a Tibet friendship group in their parliament. “I believe we can all help here by simple contribution, belief or establishment of a Seimas group that would be intended for friendship with Tibet. We will definitely initiate this,” baltic-course.com Sep 25 quoted conservative MP Monika Navickiene as having told BNS that day. 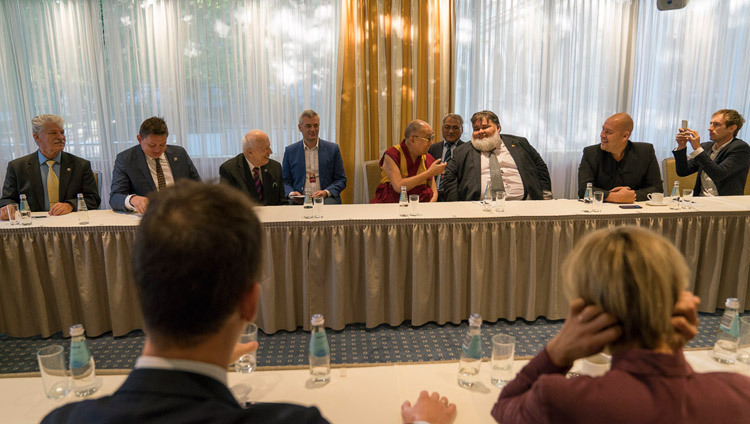 Parliaments of Latvia and Estonia already had groups for ties with Tibet, it was learnt during the meeting with the Dalai Lama, prompting the Lithuanian MPs to initiate the setting up of a similar group in their parliament, the report said. Tibet friendship groups had existed in the earlier Lithuanian parliaments. The report noted that while Lithuania viewed the Tibet region in the Himalaya Mountains as part of China, it had joined the call by the European Union for peaceful regulation of the relations between the Chinese administration and Tibet. Lithuania’s relationship with China suffered disruption when in 2013 President Dalia Grybauskaite met with the Dalai Lama in capital Vilnius. Negotiations with China on various issues stalled until Beijing issued a statement in Feb 2015, stating its willingness to develop good ties, the report said.